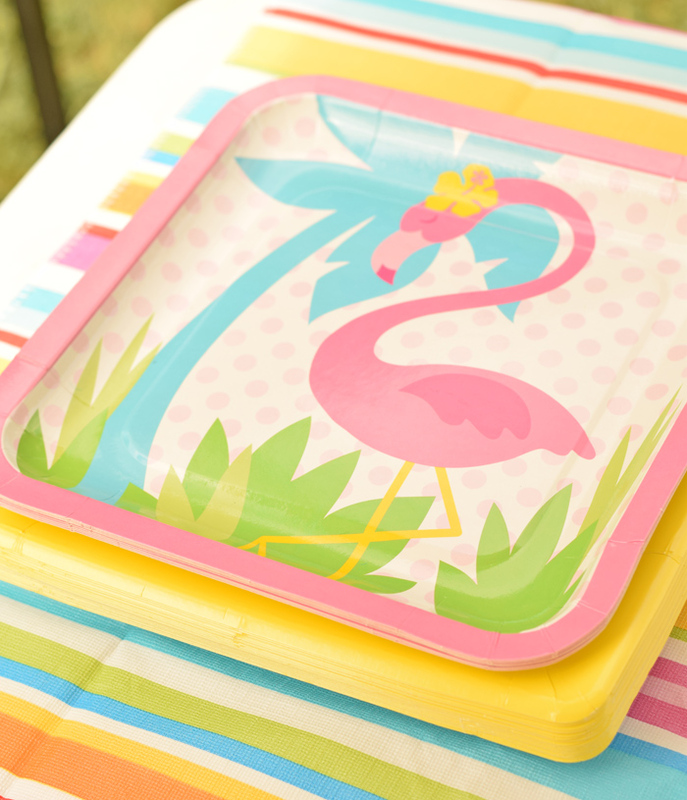 Flamingos make for a lovely party theme. 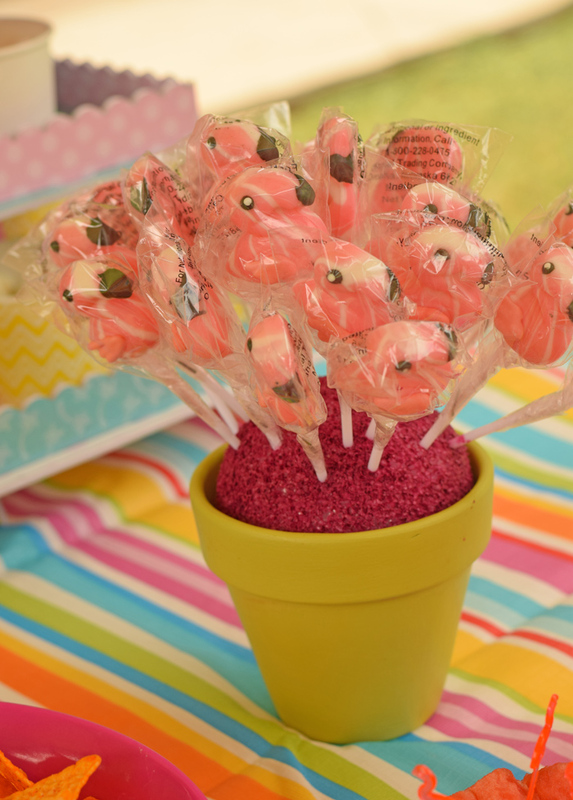 These Flamingo Birthday Party Ideas are from my daughter’s recent party. See the supply affiliate links for my recommendations on fun products and DIY items! 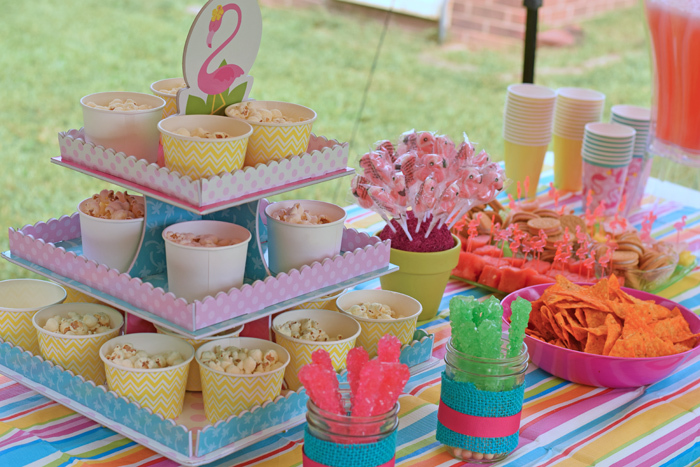 We had a great time at my daughter’s Flamingo Themed Birthday Party last weekend. 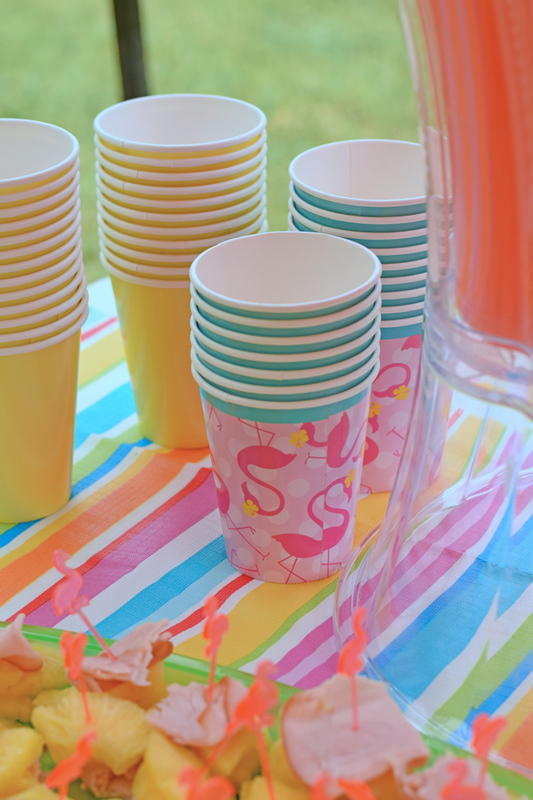 Initially, I was apprehensive to have a flamingo birthday party with water play in September. Even though we live in the south, in September the weather gets “iffy.” We will have 90+ degree scorchers one day and then need our sweaters the next. Top that with the hurricane that hit the coast, and I was definitely nervous! But God blessed us with beautiful, warm weather– the perfect day for an outdoor Flamingo Birthday Party for my special girl. I didn’t spend much time on DIY’ing decorations for this party. Instead, I ordered several flamingo themed items from Oriental Trading when they had free shipping one day. This made the party decor easy and inexpensive. The only items that I made were the DIY Lollipop Stand, the invitations, and the little jars for the rock candy. When I began planning for the party, I knew that I wanted to make cute invitations. I made these with my Cricut Explore. 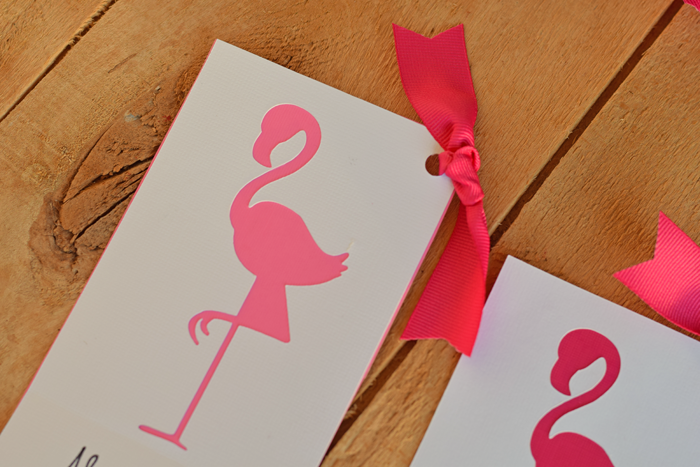 Get the full tutorial for these DIY Flamingo Party invitations here. We kept the colors fun and bright. 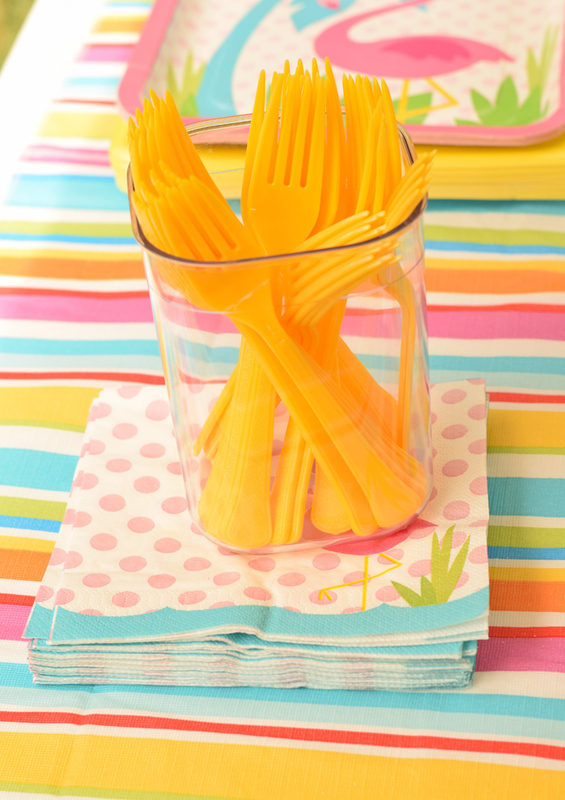 The main colors in this party are pink and yellow, with splashes of other vibrant colors like blue and orange. The plates, cups, napkins, and treat stand are from Oriental Trading. I have a beverage dispenser that I purchased a few years ago, and it has been the BEST PURCHASE EVER. I only use it a few times a year for parties, but it has already paid for itself several times over. If you host a few parties a year, then they are a great investment. Serve lemonade out of the dispenser and bottled water, and you’ve saved lots of money on buying beverages! For this party, I made pink lemonade. It wasn’t a special recipe; it was a mix that I purchased at the grocery store for a few bucks. The rock candy jars below are mason jars wrapped in colored burlap and ribbon. Have you ever used colored burlap? You can spray paint regular burlap to give it a different color, but it’s so much easier to use the kind that is already colored. The DIY Lollipop Stand was easy to make with items that I already had around the house. I offer the full tutorial for this project here. I let my daughter choose the food. Our main food was pizza. 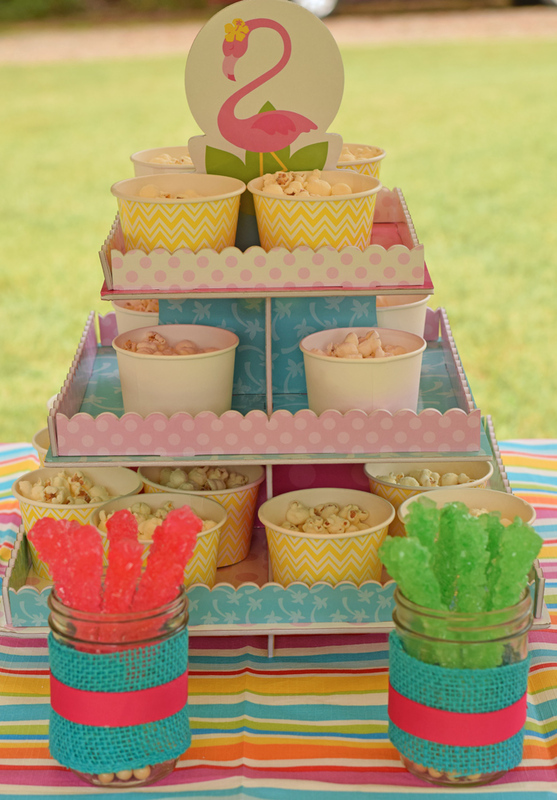 For the treat table, we had popcorn treat cups, cookies, watermelon, and ham with pineapple mini kabobs. The cute little flamingo picks from Oriental Trading were great for the fruit and mini kabobs. Kids (and adults) could have “drive by” bites while playing without having to grab a whole plate. Flamingos have been a trendy item this year. 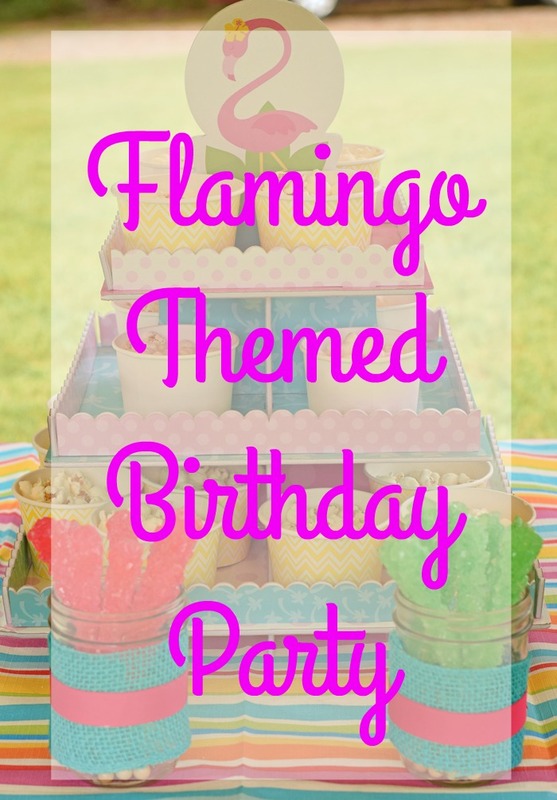 I hope these Flamingo Birthday Party Ideas give you some inspiration for your next party! Everything looks perfect and it is such a fun theme!